Mustique - beautifully manicured, with magnificent private estates, the island the stars retreat to. Not the cheapest destination - but certainly one of the best! The island, 3 miles long and 1.5 miles wide at its widest point, is hilly, with a large plain in the north and is essentially composed of seven valleys each with a white sand beach and wooded hills that rise to a height of 495 feet. 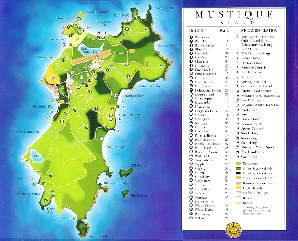 As part of St. Vincent and the Grenadines the 1,400-acre island of Mustique shares the early history common to all the islands. Initially inhabited by the Arawaks and then by the Caribs who were eventually defeated by British troops. European planters arrived in Mustique in the 1740s where they discovered they could easily and successfully produce sugar. During the 1700s, Mustique was heavily defended against the possibility of French invaders and the remains of three forts can still be seen. The Mustique Company now acts a custodian for the entire island and its mandate is to protect the environment and retain the privacy and tranquility that has made Mustique the ideal peaceful getaway. If you want complete peace, and have the money to afford it, this is an excellent place to rent a villa. Information and photograph courtesy of the The St Vincent and the Grenadines Ministry of Tourism and Culture. For more detail on the island, that’s a great place to start.